The Victorian period is so named for Queen Victoria who ruled the British Empire from 1837 to 1901. A very long reign. See http://www.pbs.org/empires/victoria for more information on her life and the British Empire. She was married to Prince Albert and had eleven children. Prince Albert dies in 1861 and Victoria goes into mourning for the rest of her life. The dark colors of the mourning dress set the maroon and dark hues we associate with the later Victorian periods. In France the Second Empire was under the rule (1852-1870) of Napoleon III and his wife Eugenie. Both of these couples (Victoria and Albert and Napoleon and Eugenie) were important inspirations for the fashion trends. http://www.En.wikipedia.org/wiki/Second_French_Empire Napoleon III was as ambitious as his uncle. Like Louis XIV and Napoleon I, he used the textile industry to further the French economy. Charles Frederick Worth (considered the first couturier) came to Napoleon and Eugenie with his designs. Worth had many connections in the textile industry and convinced Napoleon that he would use those connections in his designs. Needless to say, when Eugenie wore a Worth gown the rest of the society fell in as well. are astounding. The rapid pace of these changes parallels the rapid changes in fashion. The Early Victorian, Crinoline, or Second Empire costume is what you should envision. extremely large hem sweep with a supporting hoop or crinoline underneath the dress. garment and gradually leads to the bustle. (Shirley Temple style) hanging from the sides of the head. and occasionally wore the costume. The costume was NOT universally worn, however. Later on, it would be used as a bathing costume. looked more like today’s suits. waistcoat, and purple jacket. The collar stands up with the help of a black tie. mother but still with the tiny waist and full hem. During the Early Victorian period, technology boomed more than ever. Technological advances in electricity, photography to capture the moments (also use of documentation and primary source), Steam power, telegraphs and telephones as a means of communication, and last but definitely not the least is the sewing machines. Before the sewing machine was invented, most of the sewing was done by hand. During the Civil war, the use of a sewing machine was demonstrated and soon became the epitome of the RTW business. Without the sewing machine, it would have been impossible for designers to produce large quantities of clothing for the American growing population. Not only did the sewing machine save time and effort, it made certain garments popular because it was already made. The invention of the sewing machine made it easy for the work of an individual designer to make a certain type of garment. 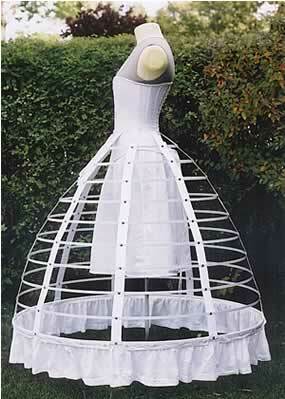 An example of the use of technical advances came the Crinoline cage. Crinoline is a stiff like type of fabric used mostly in petticoats for women’s skirts. The cage was made so that the women’s skirts would stay in place and hold out. Still during this period, corsets were still in, but the Crinoline cages were considered undergarments as well and was used for the shaping of the full skirt. This made it easy for women to move more freely under their garments. Technology today is still an important aspect in fashion. Sewing machines are more advanced and used widely in garment factories. But what happens when you mix a unique designer and the use of technology within a garment? Designer Hussein Chalayan fused both fashion and technology into one during a spring/summer collection in 2007. He took bits and pieces of garments from different eras and decades and “cross pollinated” certain garments together. He looked at what elements he could use from one era and somehow incorporated it into another era to make the garment piece look unique. Hussein definitely showed a futuristic type feel and encapsulated evolution within the garments he presented. Here in the picture, Hussein turned a simple dress into a Victorian dress making it look like she has a crinoline-like cage underneath.Technology is definitely still advancing today, and garments are getting more and more complex as time progresses. As much as we say history repeats itself, fashion is taking a different tone with designers and their unique ideas with combining fashion from the past and making it their own with a more modern day twist for the future.